In the second of our insight series, we’ve decided to do something a little different. Focusing on our qualitative feedback at scale, we have created a hierarchy of customer happiness in 2015. We’ve also predicted how this hierarchy will change by 2020. To keep customers content today, good processes, robust and proportionate security, and good customer service are all essential requirements. The proportion of 1 and 2 star banking reviews numbers 10%. A high proportion of 3 and 4 stars reviews focused on product features, quality of branch servicing, and online servicing capability. 44% of all our banking reviews are 3 and 4 star rated. Mobile for many is the icing on the cake. With very few detractors, or issues mentioned, it currently stands out as a source of delight for many reviewers. Comments focused on the ease of access/managing products on the go as well as the increasing mobile functionality offered. 46% of all reviews are currently 5 star rated. We expect customers to become increasingly demanding of this important channel, so much so that in 2020 we predict that a great mobile app will become a required feature. In 2020, we also see data emerging as a basic requirement. How banking organisations safeguard customer data and also use it in value-adding, customer-friendly ways will become an essential requirement for happy customers. As a result of the new banking entrants emerging over the next few years, and moves to make the retail banking market more competitive, we see brand as becoming an increasingly important source of value, differentiation, and a factor that can delight customers. Customers will want to join and work with organisations that make them feel valued, have a set of values that they can buy into, and have an ‘X factor’ about them. Ultimately, we see it becoming harder to please customers, and expect the proportion of banking reviews with a 5 star rating to decline by up to 25%. We have a head to head analysis between two of the largest banking brands here in the UK. We’ll look at how customer satisfaction varies across the customer journey, and pick any noticeable product variations. We’ll also use our super users (reviewers who have reviewed multiple products and brands) to illuminate some of our findings. Missed last week’s post?We analysed how consumers perceive financial products like current accounts, credit cards, car insurance and more. 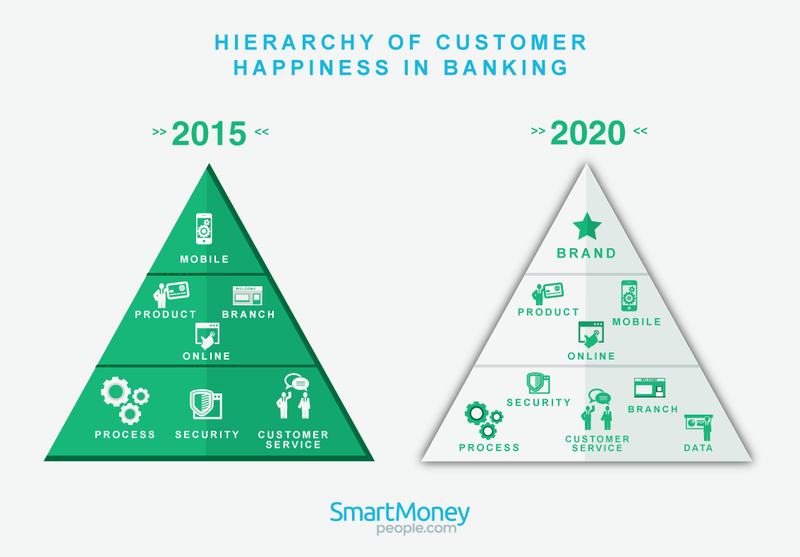 How have we created our hierarchy of customer happiness in banking? We’ve grouped all of our banking reviews into three groups: 1-2 star reviews, 3-4 star reviews and 5 star reviews. Using these groupings we then analysed the root of each review and weighted them to make our hierarchy of customer happiness in banking representative of all our consumer reviews. 2,842 banking reviews were used to create our hierarchy.